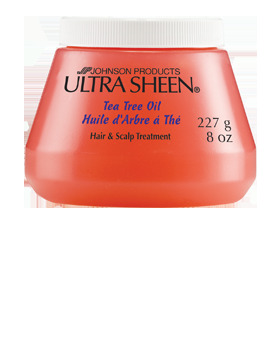 Ultra Sheen Tea Tree Oil Hair and Scalp Treatment is enhanced with nature's healing tea-tree oil and natural botanicals to relieve dry, itchy scalp and to help soothe that itching sensation. Tea Tree Oil invigorates hair and scalp by unblocking clogged hair follicles, leading to improved hair texture and density. Apply small amount to hair and scalp. Massage gently. Comb or brush hair thoroughly and style. Store in a cool place.